This type of chair are one of the earliest chair designs recorded in China, the high back design symbolises wealth & grandeur to both the owner and any person invited to sit in them. The chairs consist of a top rail with a central back splat with a carved design of a Fu character, the back splat being curved, following the natural curve of the human spine with a neck rest at the top. The arms are rounded and this shape helps to emphasize the size and also the openness of the chair. The seats are of solid elm and have a good patina (colour) with a decorative apron under the seat leading down to the footrest. 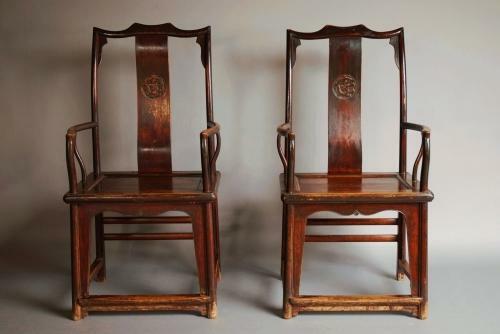 These chairs are in good condition, are of stable construction and go straight into a home.